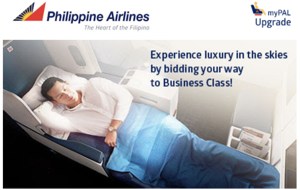 Bidding for Upgrade to Business Class on Philippine Airlines – is it worth it? Updated 2019: Philippine Airlines, like a growing number of carriers, allows you to bid to upgrade from your paid Economy Class to Business Class. Find out how you can upgrade your economy flight and enjoy more space and better food onboard, as well as priority check-in, boarding and luggage. And get my take whether it is worth to pay for the chance of a better experience or whether you should pay for Business Class directly! 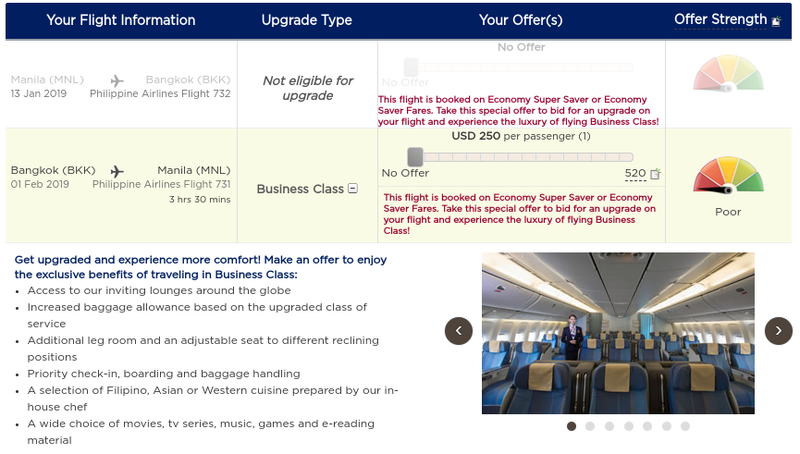 I generally welcome the opportunity to bid for an upgrade – while I might not be willing to pay full fare for a business class ticket, I can be tempted into an upgrade at a discount, if business class on the route is not sold out. The upgrade process allows the airline to maximize the revenue for their flight and gives travelers to fly in comfort at a bargain – if the bidding process is well run! Philippine Airlines send me an invite to upgrade a few days after purchasing my ticket on their website. 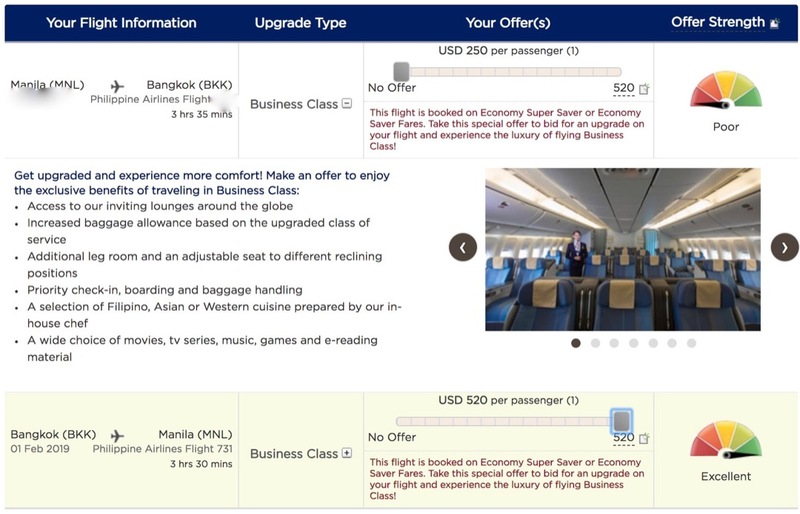 It offers a link to the bidding site with a description of what Business Class offers. Unfortunately, the bidding site uses stock photos that are not reflective of what you’ll actually get. The photos are of angles business class seats on the old Boeing B777, yet my flights feature recliners on the A321 on the outbound and fully flat beds in a 1-2-1 layout on the new A350 on the return. The bidding process offers you a simple slider, indicating the price of your bid and the chances to winning the bid from “poor” to “excellent”. In my case the minimum bid starts at $250 for each leg. While that doesn’t sound too bad for an upgrade to a fully flat bed on the return, the actual fare difference at the time of purchase was only $210 – so I could have outright purchased business class for less than bidding with a chance of getting the seat. A “good” chance to win the bid is indicated at the maximum price of $520 – more than twice the fare difference. Obviously, this makes no sense and I’m not going to bid on this. On my most recent flight on the same route, I also got an upgrade bid offer – and despite the time that’s passed, there has been no improvement to the upgrade bidding process. The situation is the same, with a A321 with recliner seats on the outbound and their flagship Airbus A350 with flat seats in a 1-2-1 layout on the return. Upgrade prices are the same, too, ranging from $250-520 – which is terrible value for the A321 and still poor value for the A350. I pointed out last time that you always run the risk that the plane is swapped out at the last minute for something else – that’s exactly what happened the last time to me! It’s disappointing to see that PAL hasn’t adjusted the bidding amounts based on the experience to date. Clearly, it’s not working as intended, because the business class on my flight was about half empty. More attractive bid amounts would certainly have improved the yield – I’d be happy to pay a fair amount to sit up front! Bottomline: Just like Malaysia Airlines bidding process, Philippine Airlines has some work to do to make this attractive for travelers. With poorly set bidding amounts, it makes more sense to purchase business class for less than bidding more and only hoping for a seat. The bidding site also needs to accurately reflect the product you are bidding for with pictures of the actual plane. Because PAL uses vastly different business class configurations, from uncomfortable recliner seats on their Airbus A340 and short-haul A321 to great flat beds on the A350, and switches the planes on short notice, it’s downright misleading to promise a product that you may or may not get. I certainly would be upset to bid for a flat bed and end up in a recliner seat not much better than economy! So, before you bid for business class on Philippine Airlines, read my PAL Business Class review to see what planes you can expect, check the plane assigned to your flight on the PAL web site as well as the fare difference and proceed with caution! If you hold a last minute, high-priced economy ticket, this could be a good deal, but with the current pricing you have to be careful not to overpay!